Adirondack chairs have been used for many years across the world as outdoor furniture. Their excellent design, simple construction and durability have earned them a storied reputation across the globe. The iconic design makes the Adirondack not only a functional chair but, to some, a work of art. How do I Maintain my Adirondack Chair? Does the Adirondack Chair Require Assembling? Do I Need to Paint my Adirondack Chair or finish it? What About Cushions, Umbrellas, Tables, and Ottomans? Can I test or View the Chairs Before Purchase? 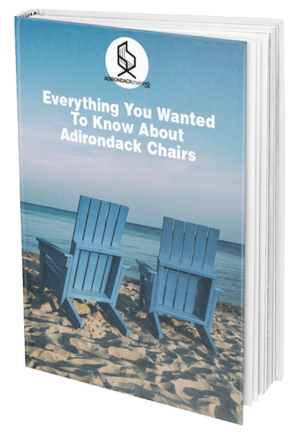 Who Came up With the Idea of Adirondack Chairs? Different people have different reasons why they like Adirondack chairs. One of the most universal reasons is their design. They are considered by some as the ultimate outdoor furniture solution. The ergonomic design of the chair provides great support for your lower back and hips and its typically-slanted seat fits how we naturally sit. The modern design usually features a rounded back and contoured seat at a deep slant to provide a comfortable angle for legs and hips to the back. Over its lifetime, the chair has been modified and redesigned in many ways. Today, you can find variants for almost any need. There are benches, tables, and armchairs varieties that can suit all family requirements, business requirements and just something for everyone. They also come in different materials including resin, wood, plastic and many others. The wood ones are more popular because they are easier to assemble anywhere in the world. It is also the traditional material for the chair. But the most important reason the best Adirondack chair is so well loved is the comfort it offers. Once you sit in it you will not want to stand back up. It is this comfort that makes many people buy or make their own. No other chair design seems to offer the level of natural comfort like an Adirondack chair. While other chairs will leave you itching, sore and tired, this chair offers you hours of comfortable rest. When sitting in it your weight will be evenly spread throughout the chair seat and back relieving undue strain on your lower back and thighs. The traditionally high and wide armrests provide not only ample real estate for books, a refreshing drink and your cell phone, but the higher-than-normal placement of the arms reduces shoulder joint stress and improves your overall comfort level while sitting. Outdoor environments are hard on furniture so anything meant to live with Mother Nature must be durable and long-lasting by design. The material used to make the chair has a huge impact on this as much as the quality of construction. We will start with the tools you require to build the chair. The process will be easier if you have an assistant who will help you. Most of these tools are commonplace. For those you don’t have, you can rent tools fairly cheaply as you need them from a local rental business. For easy reference, you may want to print out the content below to use as you are building the chair. Use a jigsaw to cut a similar shape as the side rail. You will cut this from the available stock and then sand every edge to make them smooth. Make the cuts of the back rails ensuring that you give it the right curves for the back of the chair. Take note that the bottom rail has a seven-degree bevel while the top cut is a square. As with other projects, accuracy in your measuring and cutting greatly affects the final product. It is worth the small amount of extra time needed to ensure your cuts are correct. Then cut the seat slats making the edges round by a quarter inch. For rounding purposes, you will need a stable surface to work. The parts you are getting rid of are the sharp exposed sides. The shape of the chair makes it a necessity to put bevels on the edges (you can put them on either sides or one side). 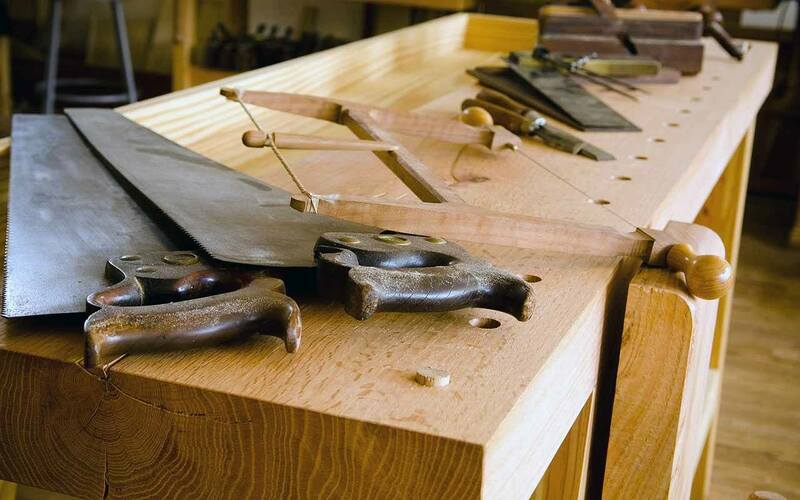 To help you cut the bevels you can use a saw or a hand plane. Start assembling the seat by putting together the low back rail with the sides by screwing the parts together with a single screw on each end. Then add the slat using 1 screw. The pieces should now form a square. Ensure the corners are square and adjust where necessary. Add screws on both ends of the two slats to secure them. Ensure there is a 1-inch gap between the slats for proper spacing. Use a wood block that has the 1-inch measurement to space the slats making sure that they uniformly align. You can now add the remaining slats accordingly. Make cuts to the front legs in their right size and ensure the edges are well rounded on the router table. Make markings on the side rails that show which side is the bottom one. Then attach the legs with screws that run from the inner side of the side rails. Make the cuts 35.5 inches of slat blank with one end 3.25 inches wide while the other is 2.25 wide. You can use your jigsaw or a band saw if you have one. Sand the cut edges to remove splinters, make the edges rounded and smooth. Cut the back legs to the right measurements and use your clamps to hold the side rails on. Then drill holes and temporarily hold the legs with screws. Attach the two ends of the back legs at the top. Then take the chair and lay it on its back so that you can attach the slats on the back. To help you screw the long slats in place easily you can use a wood block that is 4 inches thick to lift the points you want to screw. Start with the center slat and screw it in place. Identify the right position to screw it in by marking the centers of the top and bottom rails. Install the two outer slats securing the others so that the spaces are even and the curved tops are aligned to form a gentle curve. Make the cuts off the arms and the supports making sure to round the edges. Begin by clamping the arm supports in place and then screw them in so they are secure. Then continue by attaching the arms both to the rear and front legs using screws. Use grit paper to sand the surfaces of the chair until they are smooth and free of sharp edges or splinters. Note that we have used cedarwood which is oily and soft. It will not sand as smoothly or as easily as a hardwood and may require more sanding paper to complete the work. Wipe the dust and any debris from the surfaces after sanding and then apply a layer of finish using a bristle brush or other type brush which can properly spread the finish. Allow each coat to dry for 24 hours before applying the next coat. Apply at least 3 coats of finish to protect the wood from the elements. Once the final coat of finish has dried completely, your chair is ready to use. Because of the leg shape, your chair may have a tendency to dig into soft ground making the chair unstable or shift it into an awkward angle. The best placement is where all 4 legs are on a hard and even surface. Also, consider using a waterproof cover for your chairs when not in use to protect them from rain and other elements. This will prolong the life of the chair and help keep it looking great for many years to come. This depends entirely on the material used to make the chair. Different materials are maintained differently. There are Adirondack chairs made of plastic and others of wood. Plastic Adirondack chairs can be cleaned by use of water and mild soap. You can use diluted bleach on any stubborn dirt. You can sprinkle water on the chair and then dry it by wiping with a piece of cloth. If the Adirondack chair is made of wood you then need to be more cautious about the cleaning method. First, if it is unfinished you need to use a dry piece of cloth that is soft to wipe away the dust or dirt. If there are any stubborn specks of dust and dirt then use some water and mild soap. However, you need to immediately wipe it dry since unfinished wood doesn’t work well with water for long periods of time. A chair that is finished or painted usually requires only wiping down with a clean cloth. If it becomes necessary that you thoroughly clean it you can use mild soap and water but avoid using strong cleaners as they can damage the finish and wipe it dry immediately. This question is for prebuilt chairs. The simple answer is, some do and some don’t. Usually, plastic or wicker chairs come fully assembled as they are all one piece. Wood chairs may or may not require some assembly depending on the manufacturer. The plastic Adirondack chairs require no finish of any kind. Also, you do not need to finish or paint the unfinished chair but be aware that you will get color changes and cracks as part of weathering and age. However, if you decide to paint your chair then it is fine. People finish the chair to match their environment or home décor or to protect the wood better from the elements. But be very careful to follow instructions as given by the manufacturer. On many occasions, the Adirondack chairs are painted by the manufacturer. To avoid painting them yourself you can buy chairs already painted or finished by the manufacturer. If you go for the decorative option then it is recommended that you use a quality exterior paint for wood and follow the directions for applying it. Storage of Adirondack chairs depends on the material used to make them. There are sturdy materials that can withstand weather difficulties like plastic chairs which can be used in any environment. Some designs are even stackable. However, you need to make sure you store them according to instructions by the manufacturer. Cedar chairs can work well in open space but will require you to cover them whenever they are not in use. There are cushions made specifically for Adirondack chairs. Some are made of durable material to endure harsh environments. Some, however, are just for using indoors. Some manufacturers allow you to purchase them along with the chair while others will charge you separately. The same applies to umbrellas, tables, and ottomans. Before you buy to ensure that the Adirondack chair is well structured to accommodate other products from other manufacturers. You can view and sit in the chairs of manufacturers with local showrooms. Only retailers will post several pictures of the chair, but there is no way to test out the chair prior to purchase. All reputable sellers have a return policy should the chair not be what you wanted after you have purchased it. Many people love to know the historical side of things. Adirondack chairs have their history as well. The first Adirondack chair was created by Thomas Lee around 1903. Lee was searching in vain for comfortable outdoor furniture for his country cottage in Westport, NY, which is near, you guessed it, the Adirondack mountain region of upstate New York, on the banks of Lake Champlain. According to legend, Lee created several prototypes for chairs made out of just eleven pieces of knot-free wood, all from the same tree. His family — all 22 of them — tested each chair, and ultimately decided upon the gentle recline and wide armrests of what we now know as the Adirondack chair. As Lee was leaving the area he left it to a carpenter called Harry Bunnel who took the idea and patented it without permission. The people of Westport loved these chairs and used them especially in the summer. The Adirondack chair is the ultimate solution for outdoor relaxation. 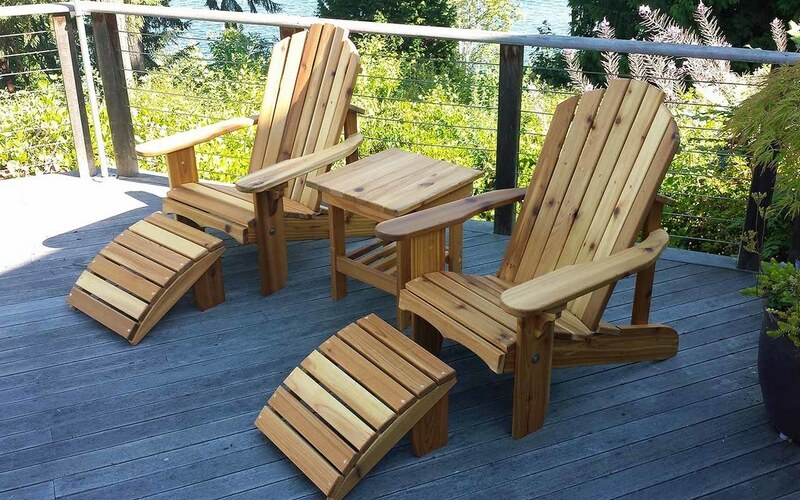 Now that you have a step by step procedure of how to build an Adirondack chair you can make one for your home. If you aren’t very handy in the workshop, you can purchase an already made chair from many different manufacturers. 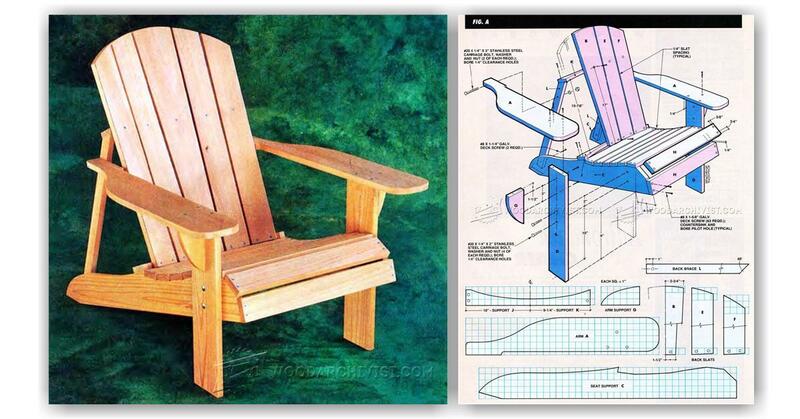 If you want some more ideas, we have 18+ ideas for DIY Adirondack Chair Building Plans.